Why does poverty measurement matter? Government and donor-supported social programs in developing countries prioritize serving the poor: those most in need, most at risk, or most marginalized. In 2014, the president of the World Bank made this explicit, stating that the mission of the Bank is to improve the lives of the poorest 40 percent of the population in supported countries. In Asia, expanding social health insurance expenditure in India, Myanmar, the Philippines, and elsewhere has been justified specifically because of the need to assure coverage of services used by the poor. The challenge is that it remains very hard to know who is poor. In some countries there are registries of the poor, with “below poverty line” identification cards given to families meeting income criteria, but the systems are imperfect and rare. In most countries, government or NGO programs for health, education, sanitation, or financial support, target poor geographic regions or slums, making pragmatic guesses about who will be served. Programs only learn how well they’ve done one or two years later, if ever, should there be an expensive program evaluation or a national census. Most programs never know how well they have done, let alone being able to asses how they’re doing at the time of service provision. This is a significant problem. Knowing how effective an initiative is at serving the population they care most about would allow a manager – of a hospital, a primary school enrollment scheme, a family planning clinic, a TB treatment initiative, or a safe drinking water project – to adjust their efforts in real time, when needed, to assure they do what they set out to do. The EquityTool makes it easy to see just how well your program is reaching the poor. 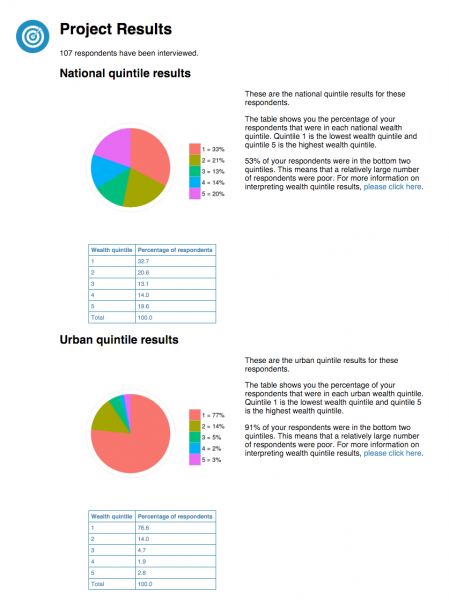 The EquityTool is based on the Demographic and Health Survey (DHS) Wealth Index, which asks between 30-60 asset ownership questions, such as ownership of a bicycle or refrigerator, land and animal ownership, the housing materials used to build the family’s dwelling, and access to water and sanitation facilities. Completing the full set of DHS questions can be time-consuming, difficult for clients to answer, and is interpreted using complex statistical analysis. Consequently, wealth assessments to inform program operations are done infrequently, if at all, and usually as part of an expensive external evaluation of the program. The EquityTool simplifies the process. The EquityTool provides an easy-to-use, easy-to-interpret, free method to assess the wealth of program beneficiaries. And it is simple enough to use as an ongoing, real-time management tool. The EquityTool uses validated questions from DHS (6 to 18, depending on the country) and benchmarks to national or urban-only comparison groups. 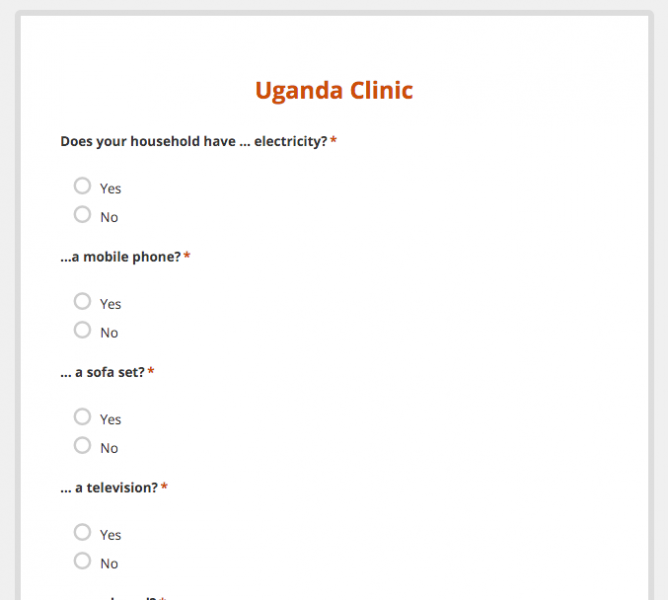 The survey works online or offline, is pre-translated into local languages, and can be completed in a few short minutes. The EquityTool also allows multiple survey enumerators to collect and upload data at the same time. Each survey project, and the data collected, is housed in a cloud-based database that is unique to the organization. To get started, visit www.equitytool.org to create an account. 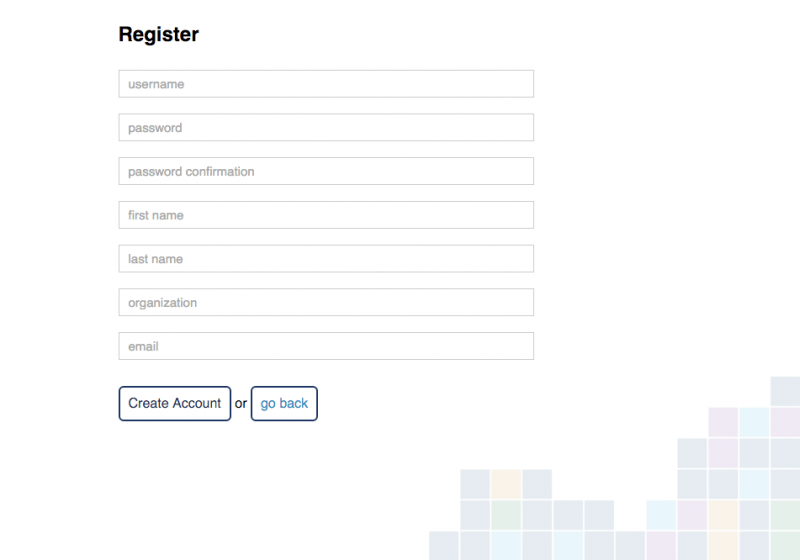 After creating an account, you can then log in to create a survey. If your program beneficiaries live in an urban area, you can select the option for “urban-focused survey.” When the results are calculated, you’ll get two sets of results: one that shows your clients’ wealth distributed against the national population, and one that shows your clients compared to the urban wealth distribution. You’re then ready to start collecting data from any browser-enabled phone, tablet, or computer. Results are calculated automatically (and in real-time). Simply sync the data and refresh the results page to get the newest quintile calculations. This makes it possible to use the EquityTool to inform clinic operations and to make day-to-day changes in service delivery, instead of waiting for an expensive, project-end evaluation. What is the science behind the EquityTool surveys? After considering different measurements of wealth, asset ownership was selected as a practical programmatic approach to measure household wealth. In the late 1990s, Filmer and Pritchett established that measuring household characteristics and material assets is a highly accurate proxy for consumption or expenditure, and much easier to collect accurately. Their work led to the Wealth Index. 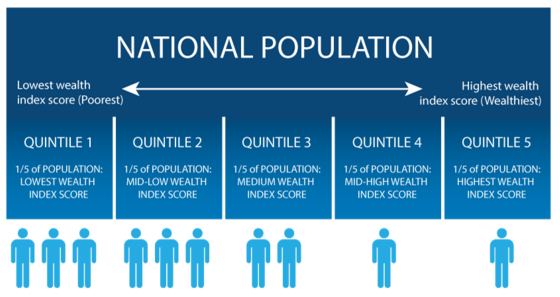 The Wealth Index divides the population into five evenly divided groups, or quintiles. Quintile 1 represents the poorest 20% sector of the population, and quintile 5 represents the wealthiest 20% sector of the population. Data to calculate the Wealth Index is collected through DHS or other nationally representative surveys of household characteristics and asset ownership. Because these questions are included in the DHS and other similar national surveys, the Wealth Index has become one of the most common methods to measure equity and is now common to most WHO, World Bank, and USAID analyses. The surveys were created through Principle Components Analysis, removing variables to achieve the simplest possible survey that still maintained consistency with the gold standard (the Wealth Index calculated using the full DHS asset questions). This simplified and country-specific approach allows more programs to measure equity, which results in improved programmatic decision-making and service delivery. Our analytical process allowed us to shorten the number of survey questions by two-thirds and to greatly simplify the questions themselves as well. The EquityTool was developed through a collaborative effort of Metrics for Management, Population Services International, USAID, Marie Stopes International, Results for Development, the International Finance Corporation, the University of California, San Francisco, and BroadBranch Advisors.